Jenny here for Shanna who is a little under the weather. A fun circle card today with a sentiment I can totally relate to! All the papers on my card are from "My Mind's Eye - On the Bright Side. I used the rusty orange color in the collection for my main panel, a striped green for the top doily and Kraft by SU for the doily behind it. 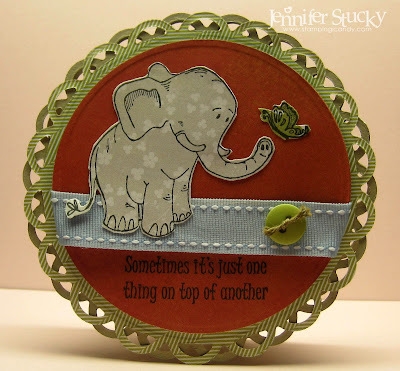 My elephant is paper pieced with a "Krafty"
color from the same collection. Isn't he sweet? The Bright Side and popped on. brand new on line store. Have you heard about our latest monthly challenge? Anything with a flower qualifies you for a great prize from Great Impressions Stamps! What a cutie! Love the circle shaped card and the fun paper pieced critters! Great job. Thanks so much. I just mustered strength to get on and check this out. I have so many blogs to look at and no energy to do. Thanks for being my cover up today. 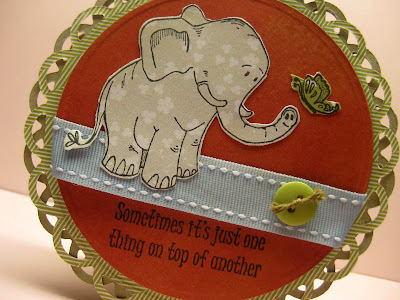 Love the elephant. Such a super cute card, and a great shaped card too! kuh-yoot! :) Are the scallop borders offset? I love how they look in the pictures! Yep, Angela the borders are offset..thanks for the sweet comment!